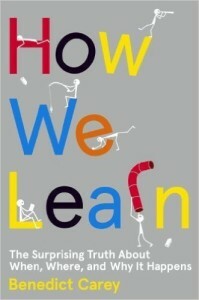 I’ve been reading a lot of books about the science of learning lately. It started a couple of years ago when I began using an article by Carol Dweck in my developmental reading/writing course—an article about fixed and growth mindset and about how such a small thing like what you believe about your own intelligence or ability can have a huge impact. My students both related to it as learners but sometimes as parents too. Since then, I have seen/read discussions of mindset everywhere and one night last fall I was reading an article on Mind/Shift and before I knew it I had ordered three books off of Amazon: Make It Stick, Thinking Fast and Slow, and The Power of Habit. I read Make It Stick right away (even though I haven’t yet reviewed it for CBR8) but that book led me to this one—How We Learn-The Surprising Truth About When, Where, and Why It Happens by Benedict Carey. Carey is a science reporter for the New York Times and in this book he attempts to show how many of the ideas we have about learning may not be right or more accurately, that scientists are learning many counterintuitive things about what facilitates learning. [This, by the way, is also the main premise of Make It Stick, which is written by two cognitive scientists and a journalist.] Carey starts with his own story as a learner—a high school grind who actually began to “learn” more in college when he took things less seriously and was pulled in more interesting directions. He then uses that story as a way into the various things that cognitive scientists now theorize about learning—many that run counter to what you learn in study skills courses. Here’s just a sampler. That idea, that you should always study in the same distraction-free place, has been disproven by research. It can actually help if you do math equations or practice conjugating Spanish verbs in a variety of contexts. The common notion of massed practice, that you should study in large chunks of time, is also debunked. There have been numerous studies that show learners learn more deeply if they space out their learning sessions and if they practice different types of things. That is, as someone learning to play guitar (as I am), it would be much better for me in the long run if I practiced for 15-20 minutes a day than in one or two hour-long sessions and if I practiced a number of different songs instead of the same song over and over and over again. The idea that my students this semester have found most helpful is the power of “testing” yourself about content versus simply reviewing a reading or lecture notes. Actually, Carey focuses a lot on what scientists are discovering about the power of testing or quizzing as an aid to learning but not in the NCLB way but as a way of getting a “real” sense of what you know and don’t know. One of my favorite chapters is called “You Snooze, You Win” and focuses on what scientists know and don’t know about what the brain does during sleep. I now see afternoon naps in a totally different light. I found this book both enjoyable to read and very interesting. There is a lot of overlap between this book and Make It Stick but they work well together to make me realize how much I don’t know about what the brain does while learning and how helpful it would be to know more about this as a teacher (and as a learner). Share the post "Learning About Learning – A Good Thing for a Teacher To Do"